This study set out to evaluate nociceptive withdrawal reflex (NWR) excitability and the corresponding mechanical response in the upper limbs during rest and movement. We used a three-dimensional motion analysis system and a surface EMG system to record, in 10 healthy subjects, the NWR in eight upper limb muscles and the corresponding mechanical response in two experimental conditions: rest and movement (reaching for, picking up, and moving a cylinder). The NWR was elicited through stimulation of the index finger with trains of pulses delivered at multiples of the pain threshold (PT). We correlated movement types (reach-to-grasp, grasp-and-lift), movement phases (acceleration, deceleration), and muscle activity types (shortening, lengthening, isometric) with the presence/absence of the NWR (reflex-muscle pattern), with NWR size values, and with the mechanical responses. At rest, when the stimulus was delivered at 4× PT, the NWR was present, in all muscles, in >90% of trials, and the mechanical response consisted of wrist adduction, elbow flexion, and shoulder anteflexion. At this stimulus intensity, during movement, the reflex-muscle pattern, reflex size, and mechanical responses were closely modulated by movement type and phase and by muscle activity type. We did not find, during movement, significant correlations with the level of EMG background activity. Our findings suggest that a complex functional adaptation of the spinal cord plays a role in modulating the NWR in the transition from rest to movement and during voluntary arm movement freely performed in three-dimensional space. Study of the upper limb NWR may provide a window onto the spinal neural control mechanisms operating during movement. We thank Catherine Wrenn for her valuable assistance in the revision and editing of this manuscript. There is growing evidence that the excitability of lower limb nociceptive and non-nociceptive spinal reflexes can be markedly influenced by the execution of rhythmic locomotor activities in a task-, intensity-, and phase-dependent manner (Lisin et al., 1973; Crenna and Frigo, 1984; Stein and Capaday, 1988; Duysens et al., 1990, 1992; Yang and Stein, 1990; Rossi and Decchi, 1994; Zehr and Stein, 1999). The nociceptive withdrawal reflex (NWR) proved to be a useful tool for investigating changes in spinal cord function during rhythmic lower limb movements in humans (Duysens et al., 1990, 1992; Rossi and Decchi, 1994; Andersen et al., 2001, 2003; Spaich et al., 2004; Sandrini et al., 2005). It is easily recorded in several limb muscles as a clear and stable EMG response after painful electrical stimulation of several nerves (Willer, 1977, 1983, 1990; Sandrini et al., 1993, 2005; Skljarevski, and Ramadan, 2002). Although the flexion synergy evoked by painful stimuli primarily serves a protective function, various studies have shown that the NWR also fulfils a more complex motor function. In addition to state-dependent modulation of the lower limb NWR, a phasic flexibility of the reflex in the various phases of locomotion has also been demonstrated (Duysens et al., 1992; Burke, 1999). This phasic flexibility of the NWR derives from the activity of interneurons thought to form a complex neural network that is part of a spinal central pattern generator activated during postural and locomotor activities (Jankowska et al., 1967a,b; Lundberg, 1969, 1979; Grillner, 1985; Rossignol and Dubuc, 1994; Schomburg et al., 1998). The few studies that have investigated spinal reflexes during rhythmic upper limb movements have shown, in some muscles, a phase-dependent modulation of the kind observed in the lower limbs during walking (Zehr and Chua, 2000; Zehr and Kido, 2001; Zehr and Haridas, 2003). However, these studies considered cutaneous-muscular reflexes evoked by modest, nonpainful stimulation and evaluated during cyclical active or passive rhythmic movements constrained by a hydraulic ergometer (Zehr and Chua, 2000; Carroll et al., 2005). Therefore, data on the modulation of spinal reflexes after painful stimulation during arm movements are currently lacking. Furthermore, no studies have investigated spinal reflexes during unconstrained upper limb movements freely executed in three-dimensional space. Hand motor function is particularly important in humans for reaching and grasping as well as exploring and manipulating objects, and arm and hand movements are under more complex neural control than leg and foot movements. Therefore, study of the modulation of the NWR during voluntary movements of the upper limb may broaden understanding of the spinal mechanism involved in this complex motor function. This study set out to do the following: (1) evaluate NWR excitability both at rest and during visually guided and practiced movement; (2) correlate the NWR with type of movement [reach-to-grasp (RG) and grasp-to-lift (GL)], phase of movement (acceleration, deceleration), and type of muscle activity (shortening, lengthening, isometric); (3) correlate the NWR size with the background EMG level during movement; and (4) evaluate the mechanical withdrawal responses induced by painful stimulation during rest and movement. Ten right-handed healthy adults (six males, four females; age range, 24–35 years) gave their written informed consent to participate in the study, which had received local ethics committee approval. All human experimentation was conducted in conformity with the Helsinki Declaration. Before starting formal measurements, the subjects underwent an initial training session to become familiar with the assessment procedures. We used the ELITE motion analysis system (BTS S.p.a., Milan, Italy) to record movements in three-dimensional space. The system consists of eight infrared cameras (100 Hz sampling rate) that track the motion of passive reflective markers. Synchronized acquisition and data processing was performed using Analyzer software (BTS S.p.a.). We positioned 10 reflective markers (15 mm in diameter) on the left and right acromion, the spinous process of the seventh cervical vertebra, the right olecranon, the right styloid ulnar and radial process, the head of the third metacarpal bone, the sacrum, and the right and left anterior superior iliac spine. We used a biomechanical model consisting of four segments (hand, forearm, arm, and trunk of the right side) as described previously (Rab et al., 2002). Surface EMG signals were recorded using an eight-channel fiber optic TELEMG system (BTS S.p.a.) sampling at a frequency of 1000 Hz and bandpass filtered at 10–400 Hz. EMG activity was recorded through a pair of Ag/AgCl surface electrodes (diameter, 1 cm; distance between electrodes, 2 cm), prelubricated with electroconductive gel, and placed over several antagonist limb muscles, including the deltoid (anterior and posterior), pectoralis major, latissimus dorsi, brachioradialis, triceps brachii, flexor carpi radialis, and extensor carpi radialis, in a belly-tendon montage according to standard anatomical landmarks. An antagonist muscle pair was chosen for each joint movement: wrist flexion-extension (flexor and extensor carpi radialis), elbow flexion-extension (brachioradialis and triceps), shoulder anteflexion-retroflexion (anterior and posterior deltoid), and shoulder horizontal adduction–abduction (pectoralis major and latissimus dorsi). We chose the brachioradialis muscle instead of the biceps brachii, because at rest and during movement, the arm was held pronated (see below, Experimental procedure). EMG data were processed off-line on a personal computer using dedicated software (Myolab; BTS S.p.a.). The right median nerve was stimulated percutaneously through a pair of ring electrodes applied to the digital nerve of the index finger as described previously (Cambier et al., 1974; Bouhassira et al., 1993; Floeter et al., 1998). The stimulus consisted of 20 ms trains of five rectangular pulses (1 ms duration, 200 Hz frequency) delivered randomly every 5–20 s through a constant current stimulator (Grass S-88 stimulator; Grass Instruments, Quincy, MA) integrated with the motion analysis system. To ensure the delivery of painful stimuli, we calculated the individual pain threshold (PT) using a staircase method (Willer, 1977). Pain threshold was defined as the stimulus intensity rated as painful after a series of 20 increasing and decreasing electrical stimuli. Given the close correlation between NWR threshold and pain sensation (Willer, 1977), the electrical stimulus was delivered at several times the PT at rest (see below, Experimental procedure) to obtain, at rest, stable, and reliable EMG muscle reflexes and limb mechanical withdrawal responses that could be compared with the responses obtained during movement. The subjective intensity of the painful sensation elicited by the electrical stimulation was rated by the subjects on an 11-point numerical scale [visual analog scale (VAS)], graded from 0 (no pain) to 10 (unbearable pain). To ensure that stimulus intensity remained at the required multiple of the PT throughout the experimental procedure, the PT was checked at various time points, and the intensity of the stimulus was adjusted accordingly. This procedure was repeated regularly (every 10 trials) to verify the stability of the stimulus conditions. To avoid possible circadian fluctuation of the NWR (Sandrini et al., 1986), measurements were always performed at the same time of day (between 9:00 and 11:00 A.M.). The subjects were seated comfortably at a table 5 cm away from them (table height, 80 cm; width, 100 cm; depth, 60 cm) in a quiet room with normal indoor lighting. We evaluated two experimental conditions (see below). The subjects rested their arm on the table in a semiflexed position to encourage maximum muscle relaxation. In this position, the shoulder was abducted to 50° and anteflexed to 25°, the elbow was flexed to 100° with the forearm fully pronated, the wrist was in line with the forearm, and the fingers were spontaneously flexed (Fig. 1a,b). The electrical stimuli were delivered at 1×, 2×, 3×, and 4× PT. Twenty trials at each intensity were recorded in each subject. Schematic representation of the motor sequence. a shows the starting position, cylinder position, and trajectory performed by the subject to reach for, grasp, and lift the cylinder. b shows how the motor sequence is performed [i.e., starting position (1), reaching for the cylinder (2), grasping the cylinder (3), lifting the cylinder (4), and bringing the cylinder (5) back to the starting position (6)]. 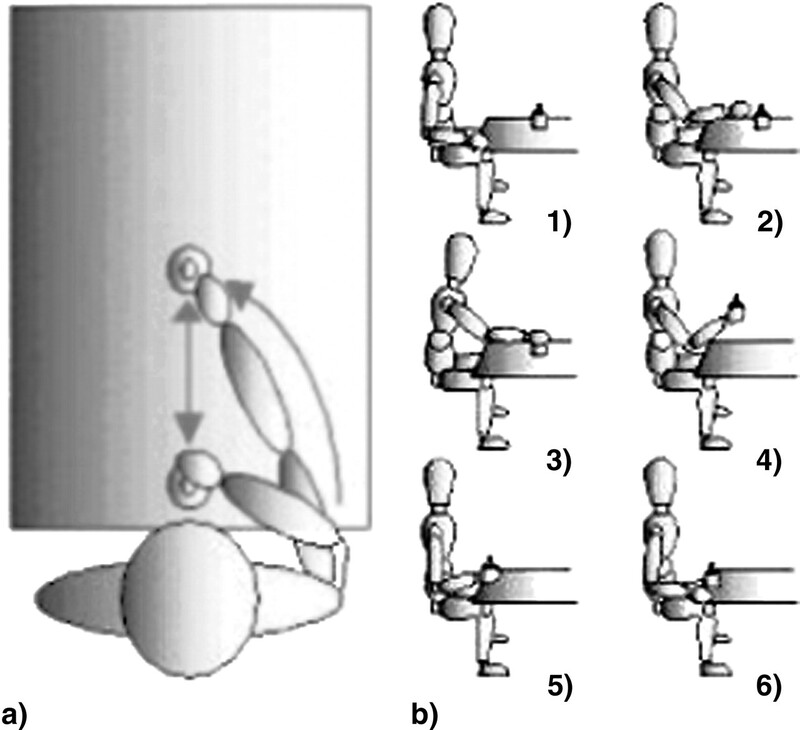 The subjects were required to perform a motor sequence consisting of reaching out from a starting position (the above-described relaxed resting position of the upper limb), picking up a cylinder (diameter, 3 cm; height, 6 cm; weight, 300 g), and returning the cylinder to the starting position (Fig. 1a,b). The starting position (A) and cylinder location (B) were 40 cm apart (Fig. 1a). After hearing an acoustic start signal, the subjects, without displacing their trunk and head, had to reach out rapidly, following as linear a trajectory as possible, and grasp cleanly the cylinder between thumb and index finger. The subjects' posture at rest was checked before each trial, and the required speed of the movement was established during the practice session. The subjects were allowed periodic breaks to minimize fatigue. Perturbed (n = 100 trials) and unperturbed (n = 20 trials) movements were recorded in each subject. In the perturbed movement trials, electrical stimuli were randomly delivered at 4× PT throughout the motor sequence. For the kinematic data analysis, we evaluated the angular displacement and velocity of the wrist, elbow, and shoulder joints. We considered adduction–abduction and flexion-extension movements of the wrist, flexion-extension movements of the elbow, and anteflexion-retroflexion, horizontal adduction-abduction movements of the shoulder. The movement trajectory was ascertained from the displacement of the wrist marker. Given the linear nature of the required movement, the wrist marker displacement had to be as similar as possible in length to the distance (40 cm) between the starting position and the cylinder location (points A and B). We discarded trials in which the trajectory length exceeded this distance by >5% (2 cm) in the anteroposterior direction. Movement type and phase were identified on graphs by plotting the velocity data collected from the wrist marker as it moved in the anteroposterior direction (Fig. 2). , absence of the reflex. Onset of RG movement was defined as the point on the graph at which the wrist marker velocity exceeded the threshold velocity of 0.025 m/s in the anterior direction in three consecutive samples. Transition from RG to GL movement corresponded to the switch from positive to negative velocity. Termination of GL movement was defined as the point on the graph at which wrist marker absolute velocity fell below the velocity threshold in the opposite direction. Both of the movement types, RG and GL, were divided into an acceleration phase (RGAP, from onset to positive peak velocity; GLAP, from the velocity switch to negative peak velocity) and a deceleration phase (RGDP, from the positive peak velocity to the velocity switch; GLDP, from the negative peak velocity to the end of the movement). In each phase of movement, the type of muscle activity was identified on the basis of the direction of joint displacement during movement in the unperturbed and perturbed trials. Muscle activity was defined as “shortening” when the physiological muscle action coincided with the direction of joint movement and as “lengthening” when it opposed it. Isometric contraction was defined as the presence of muscle EMG activity not producing a significant joint displacement (angular velocity, <5°/s in the same direction for at least 100 ms). To evaluate the mechanical responses during both rest and movement, we measured the kinematic data in the 125–200 ms window after the painful electrical stimulation. This window was chosen because it comprised the interval in which, according to previous studies of the lower limb (Duysens et al., 1992; Zehr et al. 1997; Spaich et al., 2004), the peak mechanical change can be expected to occur. To evaluate the mechanical response induced by electrical stimulation at rest, we simply compared the wrist, elbow, and shoulder angular displacement values with those recorded in the starting position. where ωp is the absolute value of joint angular velocity in the perturbed trial, ωu is the corresponding baseline value, and ωSDu is the SD of the unperturbed trials. A–D, Procedure adopted to identify the presence and/or absence of the NWR in each perturbed trial during movement. Raw EMG signals recorded during the motor sequence were full-wave rectified. Given that previous authors reported the presence of the NWR between 60–90 and 150–180 ms after the start of the stimulus (Hugon, 1973; Cambier et al., 1974; Willer, 1977; Bouhassira et al., 1993; Floeter et al., 1998), we sampled EMG activity in the time window from 60 to 200 ms after the stimulus. where EMGpost is the muscle EMG area in the 60–200 ms window, EMGpre is the baseline value, and EMGSDpre is the SD of the EMG baseline values. The SD of the baseline values was used as the denominator in the formula to reduce the variability resulting from different levels of EMG activity, secondary both to possible different degrees of muscle relaxation and to signal noise. where EMGp is the muscle EMG area in a single perturbed trial, EMGu is the baseline value, and EMGSDu is the SD of the baseline area values. The SD of the baseline values was used to reduce the variability of the EMG background activity of the unperturbed trials during movement and thus to avoid underestimation or overestimation of NWR size. To test the reliability of the motor performance, 60 unperturbed trials were tested in six subjects in two different sessions conducted within a period of 7 d. In each trial, both joint angular displacements and EMG muscle activity data were normalized to the movement duration. To assess intraindividual variability, we calculated, in each subject, the mean and SD values of joint angular displacements, EMG muscle activity, and duration of motor sequence and movement phases and then computed the coefficient of variation (CV). To assess inter-individual variability, we calculated the mean and SD values of joint angular displacements, EMG muscle activity, and duration of motor sequence and movement phases, and then computed the CV. The t test was used to evaluate differences in joint ranges of motion during each movement phase and the duration of the entire motor sequence in the unperturbed and perturbed movement trials. The χ2 test was used to compare the reflex-muscle pattern (presence/absence of the NWR) with the following variables: experimental condition (rest, movement, movement type (RG, GL), movement phase (RGAP, RGDP, GLAP, GLDP), acceleration (APs = RGAP + GLAP) and deceleration (DPs = RGDP + GLDP) phases, muscle activity type (shortening, lengthening, isometric), various combinations of movement and muscle activity types, and combinations of APs and DPs with muscle activity types. The same comparisons were analyzed considering mean NWR size and using the ANOVA test. Univariate linear regression analysis was performed for each muscle to correlate NWR size (ΔSD × EMGp) with the corresponding unperturbed EMG background activity (EMGu) (see Eq. 3). Nonparametric Mann–Whitney tests were used to compare VAS values in rest and movement trials. Descriptive statistics included mean values ± SD. p values <0.01 were considered statistically significant. The mean PT, considering all the subjects, was 13.4 ± 3.8 mA (range, 9–17). During the course of the experiment, a change in the PT, always <10% (range, 3–8%) of the mean value, was observed in a mean of 3.8 ± 1.6 checks (range, 1–5), and the stimulus intensity was adjusted accordingly. No changes in wrist, elbow, or shoulder angles induced by the painful stimulation at 1× PT and 2× PT were recorded. At 3× PT, we recorded a mild elbow flexion (2.3 ± 0.8) and shoulder anteflexion (1.9 ± 0.9). At 4× PT, the mechanical withdrawal response induced by the painful electrical stimulus was observed in >90% of the trials in all of the joints and consisted of wrist adduction (5.2 ± 1.4°), elbow flexion (6.5 ± 2.8°), and shoulder anteflexion (5.4 ± 2.5°). The CV of joint angular displacements, EMG activities, duration of motor sequence, and movement phases during movement was within the ranges of 0.04–0.08 (intraindividual variance) and 0.03–0.09 (interindividual variance) for all measurements. No trials were discarded because of excessive trajectory length in unperturbed trials. A significant difference in the duration of the motor sequence between unperturbed and perturbed trials was observed (0.95 ± 0.13 vs 1.32 ± 0.41 s, respectively; p < 0.01). We did not find significant differences in joint ranges of motion between unperturbed and perturbed trials in any movement phase (t test; all p > 0.05). Table 1 shows the kinematic data of the entire motor sequence obtained from perturbed movement trials in all of the subjects. Movement occurred at the elbow and shoulder joints, whereas no movement was observed at the wrist joint. The table gives the direction of the joint displacement, the pattern of the angular velocity change, and the mean values of angular velocity change for each joint movement and each movement phase. Positive/negative values represent increases/decreases in angular velocities with respect to the baseline values. As shown, decreases in angular velocity were observed in the APs, whereas increases were found in the DPs of both movement types. This was observed in >88% of the trials for all joint movements (Table 1). 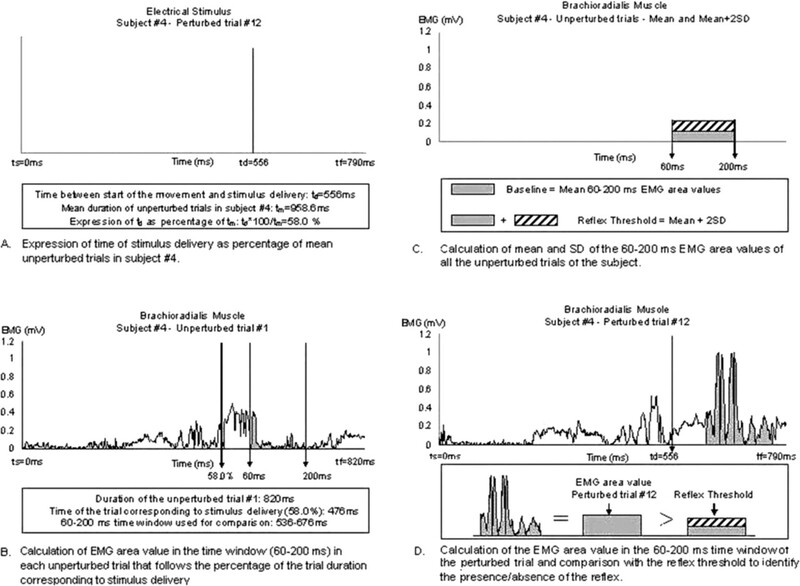 Table 2 shows the reflex muscle patterns in the 200 analyzed trials in relation to the intensity of the stimulation (expressed as a multiple of the PT). As seen in the table, at 4× PT, the reflex was present in all of the muscles in >90% of trials. The NWR size mean values at rest in each muscle were significantly higher than the corresponding values in the movement trials (Table 3). In total, we analyzed 200 unperturbed trials and 1000 perturbed trials during movement at 4× PT. The reflex muscle pattern was found to be differently related to movement type, movement phase, and muscle activity type (Fig. 2, Tables 4, 5). In all significant associations, the NWR was observed in >83% of the trials (Table 4). The reflex muscle pattern in the flexor carpi radialis and extensor carpi radialis was significantly associated with the motor sequence, the reflex being more frequently present during the GL movement (χ2; all p < 0.01) (Tables 4, 5). No significant associations emerged either with movement phases or APs/DPs (χ2; all p > 0.05) (Tables 4, 5). The reflex muscle pattern in the triceps brachii and pectoralis major was significantly associated with the movement phases and with the combination of APs/DPs with muscle activity type, the reflex being more frequently present during RGDP and GLAP, and during APs with muscle lengthening and DPs with muscle shortening (χ2; all p < 0.01) (Tables 4, 5). No significant association was found with the type of movement, APs/DPs, or type of muscle activity (χ2; all p > 0.05) (Tables 4, 5). The muscle reflex pattern in the brachioradialis and latissimus dorsi muscles was significantly associated with phase of movement and with the combination of APs/DPs with muscle activity type, the reflex being more frequently present during RGAP and GLDP, and during APs with muscle lengthening and DPs with muscle shortening (χ2; all p < 0.01) (Tables 4, 5). No significant association was found with type of movement, APs/DPs, or type of muscle activity (χ2; all p > 0.05) (Tables 4, 5). The muscle reflex pattern in the anterior deltoid and posterior deltoid muscles did not show a significant association with any of the variables under consideration (χ2; all p > 0.05) (Tables 4, 5), the reflex being present in most of the trials in the posterior deltoid and absent in the anterior deltoid (Tables 4, 5). In the various elbow and shoulder muscles, the NWR mean size significantly differed in relation to the movement variables under consideration (Tables 6, 7). No linear association was found between reflex size and EMG background activity during movement for any muscle. No significant differences in the mean VAS scores were found between rest and movement trials in each subject (7.5 ± 2.0 vs 7.6 ± 2.2; p > 0.05). This study showed that the NWR changes markedly from rest to movement and that its excitability is finely modulated during the natural motor action of reaching for, grasping, and lifting an object. In particular, we found that: (1) the muscle reflex pattern in the wrist muscles was closely related to the movement type; (2) the muscle reflex pattern in the elbow muscles and shoulder pectoralis major and latissimus dorsi muscles was closely related to the movement phase and to different combinations of movement phase with type of muscle activity; (3) the size of the NWR in all of the arm muscles was significantly modulated by movement type, phase, and muscle activity type, whereas it was not significantly related to the level of EMG background activity during movement; and (4) the painful electrical stimulation induced a stereotyped motor response during rest and a complex change of the elbow and shoulder angular velocities during movement. 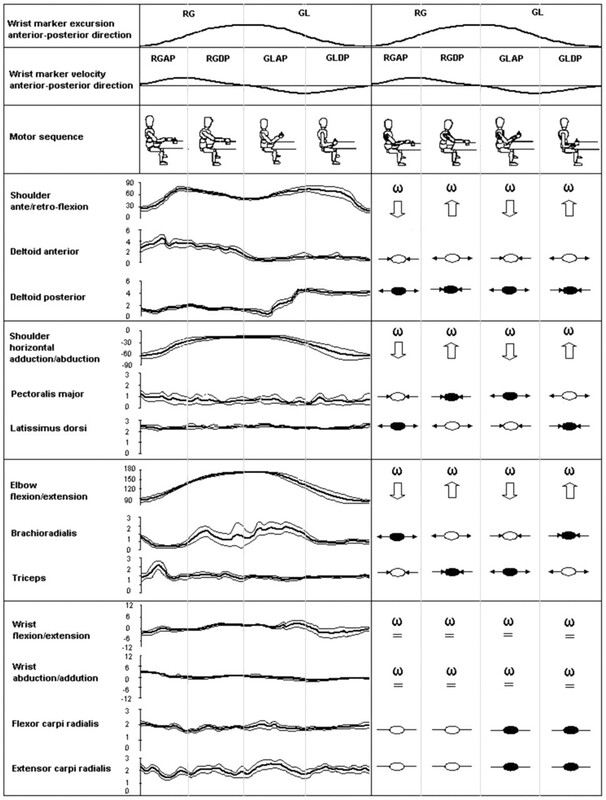 This study is the first to document and quantify NWR modulation during unconstrained arm movements freely performed in three-dimensional space, and it extends previous evidence of phase and task modulation of other upper limb spinal reflexes (MacKay et al., 1983; Zehr and Kido 2001; Zehr et al., 2003; Zehr and Hundza, 2005). In our study, the NWR pattern changed markedly from rest to movement in a way similar to that observed in the lower limbs in which different adaptive behaviors of nociceptive reflexes during standing or walking have been observed (Duysens et al., 1992, 1993; Brown and Kukulka, 1993; Rossi and Decchi, 1994; Decchi et al., 1997; Andersen et al., 2003; Spaich et al., 2004). During standing, the muscle reflex pattern in distal muscles, such as the soleus and tibialis anterior, is shifted toward the plantar flexors when compared with rest conditions (Andersen et al., 1999). During movement, the withdrawal EMG and mechanical responses can be enhanced or reduced depending on the swing and stance phases of the gait cycle (Duysens et al., 1990, 1992; Spaich et al., 2004). In our study, all of the muscles displayed the NWR at rest; conversely, during movement, the NWR was present in some muscles but not in others, depending on the type and phase of movement and the type of muscle activity associated with the movement (Fig. 2, Tables 3, 4, 5). Furthermore, the transition from rest to movement changed the size of the NWR, which was found to be markedly greater at rest than during movement (Table 4). However, this last result should be carefully considered, taking into account the different conditions of the muscles at rest and during movement. Thus, the NWR behaved in a state-dependent manner in the transition from rest to movement. Here, the term state is used in accordance with Burke's description (1999), which relates the different behavior of the spinal reflexes to the different states of the CNS. At 4× PT stimulus intensity, we recorded a stereotyped mechanical response (wrist adduction, elbow flexion, shoulder anteflexion) in all of the subjects at rest. This motor “flexion” response seems to serve solely to withdraw the limb from the noxious source. In the transition from rest to movement, the NWR mechanical response was dramatically reorganized as a result of the movement itself, displaying no close correlation with pain sensation, and acquiring a more complex significance, which is possibly not only nocifensive. In animals and humans, the flexion reflex seems to behave as a nociceptive reflex at rest and as a non-nociceptive reflex during voluntary muscle contraction and movement (Lundberg, 1969, 1982; Rossi and Decchi, 1994; Andersen et al., 1995). Therefore, a complex interaction between nociceptive and non-nociceptive inputs and the spinal interneurons mediating the NWR (including interneurons of Ia and Ib reflex loops) may explain the changes in the NWR pattern in resting versus movement conditions as well as in the different movement phases. In this context, the NWR spinal circuitry operating during movement may be dynamically selected and optimized (McCrea, 2001). We found marked differences in the NWR pattern and size in relation to the types and phases of movement and types of muscle activity (Fig. 2, Tables 456–7). The NWR in the elbow and shoulder muscles was more frequently present in the acceleration phases when the muscle lengthened and in the deceleration phases when the muscle shortened. The switch from one phase to the other induced a reflex reversal, because the same antagonist muscle pairs were activated, but in reverse (Fig. 2, Tables 4, 5). For example, at the elbow joint, the brachioradialis muscle showed the NWR during the RGAP (when it lengthened) and during the GLDP (when it shortened). The triceps also behaved in this way, the reflex appearing both during the GLAP (when it lengthened) and during the RGAP (when it shortened). It has been shown that rapid movements are associated with a biphasic or triphasic pattern of muscle contraction (Wachholder, 1928; Hallett et al., 1975). Movement onset is characterized by an initial acceleration during which the agonist muscle is strongly activated to initiate the movement. Subsequently, when the limb reaches maximal velocity, agonist activity is transiently inhibited while the antagonist muscle is activated to decelerate the movement. These results indicate that the NWR appears in those elbow and shoulder muscles that counteract the acceleration pattern of the ongoing movement phase. On the contrary, wrist extensors and flexors, which cocontracted isometrically throughout the motor sequence, did not show any triphasic pattern, and appearance of the NWR in these muscles depended on the movement type (GL). In this study, we found no correlation between NWR size and background EMG level during movement. This is in line with the recent suggestion that background EMG activity per se fulfills no physiological conditioning function (Hermens et al., 2000). Our findings show modulation of the NWR (in terms of reflex muscle pattern, reflex size, and mechanical response) during motor execution. The appearance of the NWR in the elbow and shoulder muscles during early reaching (i.e., RGAP), when they act as antagonists, suggests that the NWR may serve to interrupt movement abruptly, as demonstrated by the decrease in joint angular velocity (Fig. 2, Tables 1, 4). Conversely, during late reaching (i.e., RGDP), the NWR in the elbow and shoulder muscles was associated with an increase in joint angular velocity, indicating that the most appropriate mechanical response to a painful stimulation may change during movement. This suggestion is supported by recent evidence, in both animals and humans, that shows each muscle or group of muscles mediating the NWR has a separate cutaneous receptive field (Schouenborg et al., 1992, 1994; Andersen et al., 1999, 2001; Schouenborg, 2002; Clarke and Harris, 2004). Therefore, the stimulation of particular limb areas will activate only those modules best positioned to evoke the most suitable mechanical response. On the contrary, both extensor and flexor wrist muscles displayed the reflex only when objects were grasped and lifted. Cocontraction of flexors and extensors is important to stabilize the wrist during gripping and lifting (Rothwell, 1987). In this motor context, a reflex reversal behavior offers no functional advantage, and the NWR is simultaneously recorded in agonist-antagonist muscles, with no associated motor response. This strategy may assist the ongoing movement, and its significance is possibly more “proprioceptive” than nocifensive. In a broader motor control context, modulation of the NWR may be viewed as an important part of mechanisms underlying the production of movement. Experimental evidence in animals and humans (Asatryan and Feldman 1965; von Holst and Mittelstaedt, 1973; Feldman and Levin, 1995; Ostry and Feldman, 2003) suggests that to produce an intentional change in position, the system must reset the stabilizing mechanisms to a new reference posture. Such resetting is achieved by shifting the threshold position of body segments. When this is done, the initial position of body segments appears as a deviation from the new reference position so that the same posture-stabilizing mechanisms provide forces driving the system to the new position. Indeed, by shifting reflex thresholds, including the NWR, the system not only eliminates resistance to movement from the previous posture but actually takes advantage of posture-stabilizing mechanisms to drive the body to a new posture. In the motor task performed in our experiment, the overall mechanical effect of the NWR modulation is to maintain the direction of the movement (increase–decrease of elbow and shoulder joints angular velocities) or to stabilize a joint position (wrist joint), possibly indicating that joint configuration guides muscular activations to achieve the new reference position. In summary, the muscle-NWR pattern may be modulated according to the shift of the threshold position, resetting the reflex threshold in all muscles, and closely depending on the motor context. Our findings indicate that the spinal circuitry underlying the NWR, by modifying NWR excitability according to state, movement type, movement phase, and muscle activity type, adapts the reflex to the motor action. The NWR in the upper limb may provide a window onto the spinal neural control mechanisms operating during movement. Andersen OK, Jensen LM, Brennum J, Arendt-Nielsen L (1995) Modulation of the human nociceptive reflex by cyclic movements. Eur J Appl Physiol Occup Physiol 70:311–321. Andersen OK, Sonnenborg FA, Arendt-Nielsen L (1999) Modular organization of human leg withdrawal reflexes elicited by electrical stimulation of the foot sole. Muscle Nerve 22:1520–1530. Andersen OK, Sonnenborg FA, Arendt-Nielsen L (2001) Reflex receptive fields for human withdrawal reflexes elicited by non-painful and painful electrical stimulation of the foot sole. Clin Neurophysiol 112:641–649. Andersen OK, Sonnenborg FA, Matjacic Z, Arendt-Nielsen L (2003) Foot sole reflex receptive fields for human withdrawal reflexes in symmetrical standing position. Exp Brain Res 152:434–443. Asatryan DG, Feldman AG (1965) Functional tuning of the nervous system with control of movements or maintenance of a steady posture. I. Mechanographic analysis of the work of the joint on execution of a postural tasks. Biophysics USSR 10:925–935. Bouhassira D, Le Bars D, Bolgert F, Laplane D, Willer JC (1993) Diffuse noxious inhibitory controls in humans: a neurophysiological investigation of a patient with a form of Brown-Sequard syndrome. Ann Neurol 34:536–543. Brown DA, Kukulka CG (1993) Human flexor reflex modulation during cycling. J Neurophysiol 69:1212–1224. Burke RE (1999) The use of state-dependent modulation of spinal reflexes as a tool to investigate the organization of spinal interneurons. Exp Brain Res 128:263–277. Cambier J, Dehen H, Bathien N (1974) Upper limb cutaneous polysynaptic reflexes. J Neurol Sci 22:39–49. Carroll TJ, Zehr EP, Collins DF (2005) Modulation of cutaneous reflexes in human upper limb muscles during arm cycling is independent of activity in the contralateral arm. Exp Brain Res 161:133–144. Clarke RW, Harris J (2004) The organization of motor responses to noxious stimuli. Brain Res Brain Res Rev 46:163–172. Crenna P, Frigo C (1984) Evidence of phase-dependent nociceptive reflexes during locomotion in man. Exp Neurol 85:336–345. Decchi B, Zalaffi A, Spidalieri R, Arrigucci U, Di Troia AM, Rossi A (1997) Spinal reflex pattern to foot nociceptive stimulation in standing humans. Electroencephalogr Clin Neurophysiol 105:484–489. Duysens J, Trippel M, Horstmann GA, Dietz V (1990) Gating and reversal of reflexes in ankle muscles during human walking. Exp Brain Res 82:351–358. Duysens J, Tax AA, Trippel M, Dietz V (1992) Phase-dependent reversal of reflexly induced movements during human gait. Exp Brain Res 90:404–414. Duysens J, Tax AA, Trippel M, Dietz V (1993) Increased amplitude of cutaneous reflexes during human running as compared to standing. Brain Res 613:230–238. Feldman AG, Levin MF (1995) The origin and use of positional frames of reference in motor control. Behav Brain Sci 18:723–806. Floeter MK, Gerloff C, Kouri J, Hallett M (1998) Cutaneous withdrawal reflexes of the upper extremity. Muscle Nerve 21:591–598. Grillner S (1985) Neurobiological bases of rhythmic motor acts in vertebrates. Science 228:143–149. Hallett M, Shahani BT, Young RR (1975) EMG analysis of stereotyped voluntary movements in man. J Neurol Neurosurg Psychiatry 38:1154–1162. Hermens HJ, Freriks B, Disselhorst-Klug C, Rau G (2000) Development of recommendations for SEMG sensors and sensor placement procedures. J Electromyogr Kinesiol 10:361–374. Hugon M (1973) Exteroceptive reflexes to stimulation of the sural nerve in normal man. In: New developments in electromyography and clinical neurophysiology (Desmedt JE, ed.) Vol III: pp. 713–729. Basel: Karger. Jankowska E, Jukes MG, Lund S, Lundberg A (1967a) The effect of DOPA on the spinal cord. Reciprocal organization of pathways transmitting excitatory action to alpha motoneurones of flexors and extensors. Acta Physiol Scand 70:369–388. Jankowska E, Jukes MG, Lund S, Lundberg A (1967b) The effect of DOPA on the spinal cord. Half-centre organization of interneurones transmitting effects from the flexor reflex afferents. Acta Physiol Scand 70:389–402. Lisin VV, Frankstein SI, Rechtmann MB (1973) The influence of locomotion on flexor reflex of the hind limb in cat and man. Exp Neurol 38:180–183. Lundberg A (1969) Convergence of excitatory and inhibitory action on interneurones in the spinal cord. UCLA Forum Med Sci 11:231–265. Lundberg A (1979) Multisensory control of spinal reflex pathways. Prog Brain Res 50:11–28. Lundberg A (1982) Inhibitory control from the brain stem of transmission from primary afferents to motoneurons, primary afferents terminals and ascending pathways. In: Brain stem control of spinal mechanism (Sjolund B, Bjorklund A, eds) pp. 179–224. Amsterdam: Elsevier. MacKay WA, Kwan HC, Murphy JT, Wong YC (1983) Stretch reflex modulation during a cyclic elbow movement. Electroencephalogr Clin Neurophysiol 55:687–698. McCrea DA (2001) Spinal circuitry of sensorimotor control of locomotion. J Physiol (Lond) 533:41–50. Ostry DJ, Feldman AG (2003) A critical evaluation of the force control hypothesis in motor control. Exp Brain Res 153:275–288. Rab G, Petuskey K, Bagley A (2002) A method for determination of upper extremity kinematics. Gait Posture 15:113–119. Rossi A, Decchi B (1994) Flexibility of lower limb reflex responses to painful cutaneous stimulation in standing humans: evidence of load-dependent modulation. J Physiol (Lond) 481:521–532. Rossignol S, Dubuc R (1994) Spinal pattern generation. Curr Opin Neurobiol 4:894–902. Rothwell JC (1987) In: Control of human voluntary movement London: Croom and Helm. Sandrini G, Alfonsi E, Bono G, Facchinetti F, Montalbetti L, Nappi G (1986) Circadian variations of human flexion reflex. Pain 25:403–410. Sandrini G, Arrigo A, Bono G, Nappi G (1993) The nociceptive flexion reflex as a tool for exploring pain control systems in headache and other pain syndromes. Cephalalgia 13:21–27. Sandrini G, Serrao M, Rossi P, Romaniello A, Cruccu G, Willer JC (2005) The lower limb flexion reflex in humans. Progr Neurobiol 77:353–395. Schomburg ED, Petersen N, Barajon I, Hultborn H (1998) Flexor reflex afferents reset the step cycle during fictive locomotion in the cat. Exp Brain Res 122:339–350. Schouenborg J (2002) Modular organisation and spinal somatosensory imprinting. Brain Res Brain Res Rev 40:80–91. Schouenborg J, Holmberg H, Weng HR (1992) Functional organization of the nociceptive withdrawal reflexes. II. Changes of excitability and receptive fields after spinalization in the rat. Exp Brain Res 90:469–478. Schouenborg J, Weng H-R, Holmberg H (1994) Modular organization of spinal reflexes: a new hypothesis. NIPS 9:261–265. Skljarevski V, Ramadan NM (2002) The nociceptive flexion reflex in humans–review article. Pain 96:3–8. Spaich EG, Arendt-Nielsen L, Andersen OK (2004) Modulation of lower limb withdrawal reflexes during gait: a topographical study. J Neurophysiol 91:258–266. Stein RB, Capaday C (1988) The modulation of human reflexes during functional motor tasks. Trends Neurosci 11:328–332. von Holst E, Mittelstaedt H (1973) Martin R, trans. The reafference principle. In: The behavioral physiology of animals and man. The collected papers of Erich von Holst Vol 1: pp. 139–173. Coral Gables, FL: University of Miami. Wachholder K (1928) In: Willkürliche Haltung und Bewegung insbesondere im Lichte elektrophysiologische Untersuchungen Munich, Germany: Bergmann. Willer JC (1977) Comparative study of perceived pain and nociceptive flexion reflex in man. Pain 3:69–80. Willer JC (1983) Nociceptive flexion reflex as a tool for pain research in man. In: Advances in neurology (Desmedt JE, ed.) pp. 809–827. New York: Raven. Willer JC (1990) Clinical exploration of nociception with the use of reflexologic techniques. Neurophysiol Clin 20:335–356. Yang JF, Stein RB (1990) Phase-dependent reflex reversal in human leg muscles during walking. J Neurophysiol 63:1109–1117. Zehr EP, Chua R (2000) Modulation of human cutaneous reflexes during rhythmic cyclical arm movement. Exp Brain Res 135:241–250. Zehr EP, Haridas C (2003) Modulation of cutaneous reflexes in arm muscles during walking: further evidence of similar control mechanisms for rhythmic human arm and leg movements. Exp Brain Res 149:260–296. Zehr EP, Hundza SR (2005) Forward and backward arm cycling are regulated by equivalent neural mechanisms. J Neurophysiol 93:633–640. Zehr EP, Kido A (2001) Neural control of rhythmic, cyclical human arm movement: task dependency, nerve specificity and phase modulation of cutaneous reflexes. J Physiol (Lond) 537:1033–1045. Zehr EP, Stein RB (1999) What functions do reflexes serve during human locomotion? Prog Neurobiol 58:185–205. Zehr EP, Komiyama T, Stein RB (1997) Cutaneous reflexes during human gait: electromyographic and kinematic responses to electrical stimulation. J Neurophysiol 77:3311–3325. Zehr EP, Collins DF, Frigon A, Hoogenboom N (2003) Neural control of rhythmic human arm movement: phase dependence and task modulation of hoffmann reflexes in forearm muscles. J Neurophysiol 89:12–21.